How can I deal with missing data? At the beginning of this lesson we noted that all database systems have the concept of a NULL value; Something which is missing and nothing is known about it. In DB Browser we can choose how we want NULLs in a table to be displayed. When we had our initial look at DB Browser, we used the View | Preference option to change the background colour of cells in a table which has a NULL values as red. 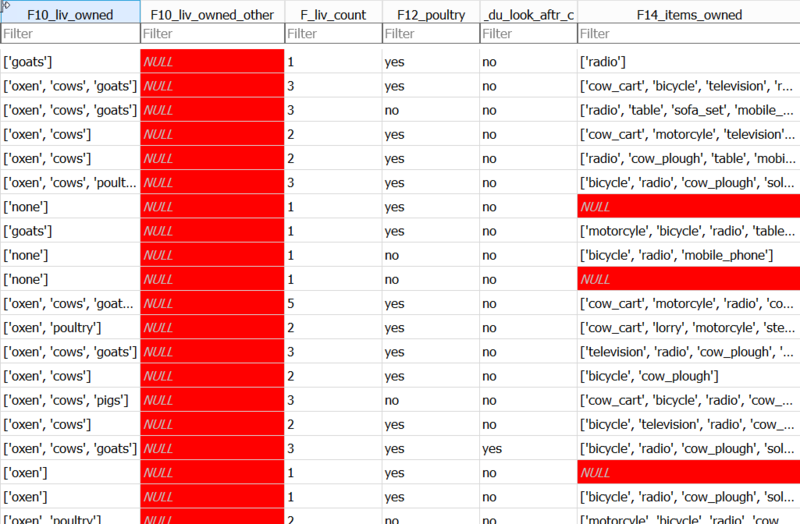 The example below, using the ‘Browse data’ tab, shows a section of the Farms table in the SQL_SAFI database showing column values which are NULL. If you type ‘=NULL’ in the filter box for ‘F14_items_owned’, only the rows with NULL in numage will be displayed. Notice that we use IS and not =. This is because ‘NULL’ equals nothing and everything all at the same time! The highlighted area shows part of the record with Id = 21, the second record returned by the query. It starts with the ‘F10_liv_owned’ column and ends with the ‘G01_no_meals’ column. The Arrow points to the two consequetive ‘,’s representing the lack of a value for the ‘F14_items_owned’ column. These values are missing from the data. There can be many reasons why data is missing; Not collected, lost, Not applicable etc. In the case of our Farms table, many of the missing values have occurred as a result of the survey design. 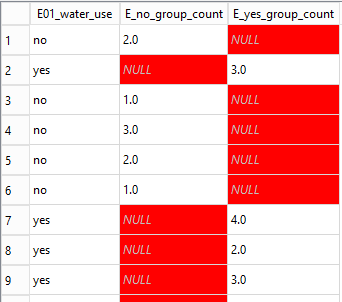 You may be able to spot from this the relationship between the values in the E01_water_use column and whether or not there is a NULL value in either the E_no_group_count or the E_yes_group_count column. Only if the Farmer said that they did use water (E01_water_use = ‘yes’) they were asked how many plots they used water on and the value stored in E_yes_group_count otherwise this field was not even presented in the survey and so contains a NULL value. In this situation we expect NULL values and they will not cause any problems. However the F14_items_owned column records the possesions of the Farmer. This question was always asked. It is not clear from the NULL values we find in this field whether or not it means ‘I have no possesions’ or ‘I do not wish to tell you what possessions I have’, in short, we know nothing about the items owned and therefore the value of NULL is appropriate. There are several statistical techniques that can be used to allow for NULL values, which one you might will depend on what has caused the NULL value to be recorded. You may want to change the NULL value to something else. For example if we knew that the NULL values in the F14_items_owned column actually meant that the Farmer had no posessions then we might want to change the NULL values to ‘’ to represent and empty list. We can do that in SQL with an UPDATE query. The update query is shown below. We are not going to run it as it would change our data. You need to be very sure of the effect you are going to have before you change data in this way. Rather than changing the data we may just want to miss it out of our analysis.